One of the new Sigma lens aspects is the category classification of A, C or S, representing a primary intended use of Artistic, Contemporary and Sports. This letter is stamped in a chrome circle on the lens barrel (visible above). A full description of these categories can be found in the Sigma 35 f/1.4 press release linked to at the end of this review, but ... I'm not a fan of this overly-simplistic categorization structure. This lens gets an A - for Artistic, but its qualities are very contemporary. And a wide aperture and quick AF system make it appropriate for close distance sports as well. Maybe "A" can also stand for "Action". 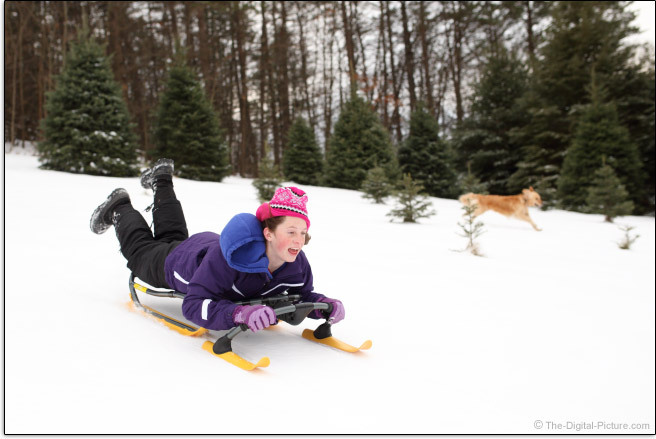 The above modestly-cropped action image was captured with a Sigma 35mm f/1.4 DG HSM Art Lens mounted on a Canon EOS-1D X. Settings were f/2.8, 1/1250 and ISO 650. Of course, a wide aperture lens is always useful for the as-categorized artistic purposes. 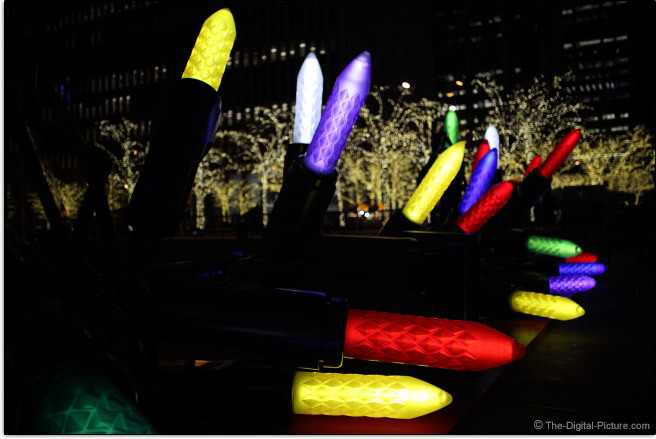 This image was taken in New York City using the Sigma 35 f/1.4 mounted on a Canon EOS 6D. Settings were f/1.4, 1/100 and ISO 100. Let's take a closer look at the aperture range available in the Sigma 35mm f/1.4 DG HSM Art Lens. While the following images to do not have great photographic merit, they allow me to make a few points. The first point will be obvious to many - that the depth of field increases significantly as the aperture becomes narrower and f/1.4 with a close subject creates a very shallow DOF. A second point is that the strong full frame vignetting in this lens clears significantly by stopping down the aperture to f/2. The shallow DOF and vignetting combination at f/1.4 can be used to successfully isolate a subject from its busy surroundings. Moving to the other end of the aperture range - the narrow end, we find specular highlights turning into 18 point stars. Odd (vs. even) numbers of aperture blades create stars with twice as many points as aperture blades. An 8-blade aperture would create 8-point stars. Know your aperture options and how/when to use them. The 35mm focal length is great for general purpose use. 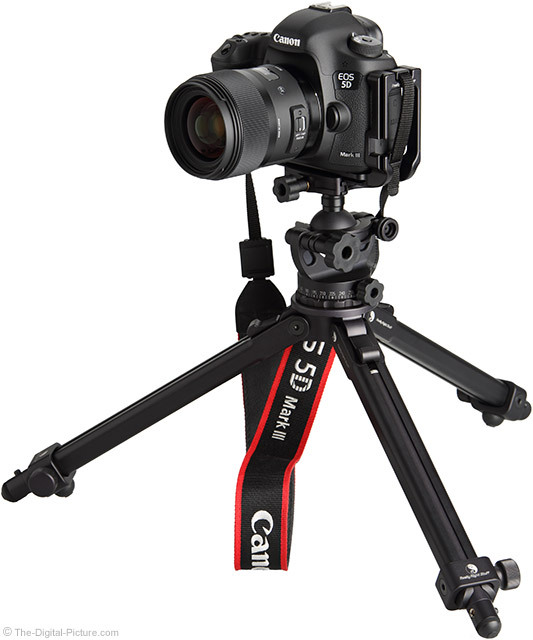 On a full frame body, 35mm provides a modestly wide angle of view and the 56mm-equivalent framing on an APS-C/1.6x FOVCF sensor format DSLRs yields a normal/standard angle of view. Uses for this lens include loosely-framed portraits, architecture, landscape, short distance/wide angle of view sports, weddings and other indoor and outdoor events (including low light venues) ... and much more. The versatility of 35mm lenses is well known by photojournalists. 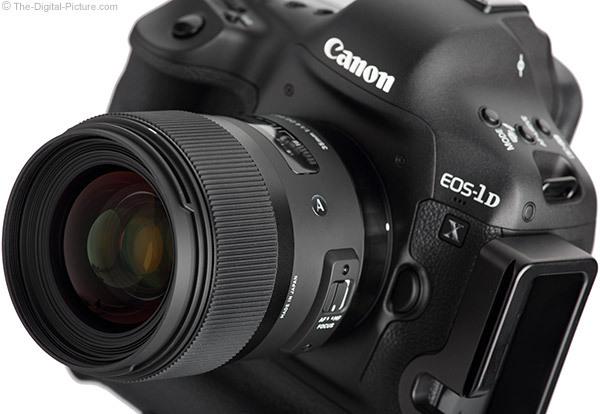 Image stabilization is not featured on this lens - or any other f/1.4 lens as of review time. While I always welcome this feature, you can shoot this lens handheld in very low light conditions without image stabilization - as long as the f/1.4 aperture is adequate for your needs. Landscape photographers looking for deep DOF will want a tripod when light levels drop - or when shooting with CP filters under even reasonable light. The just-released-at-review-time Canon EF 35mm f/2 IS USM Lens is the widest aperture image stabilized 35mm lens option right now - and it may be a better option for narrow aperture, stationary subject, handheld photography. Those trying to stop action in low light will find that f/1.4 rules. The Sigma 35mm f/1.4 DG HSM Art Lens is an impressively sharp lens - with very sharp center and mid image circle results even at a wide open f/1.4 aperture. Full frame f/1.4 peripheral image circle results are still quite good, but softer than the center results. Results are slightly sharper at f/2, but the clearing vignetting is the biggest difference noticed by stopping down. Don't expect center-of-the-frame image quality to noticeably improve by stopping down beyond f/2. Corners slowly improve until becoming very impressively sharp at f/5.6. Vignetting at f/1.4 is strong - with over 3.5 stops of corner shading in full frame images. APS-C format sensor cameras will show a just-noticeable 1 stop of shading in the corners. This amount of shading is normal or slightly strong in comparison to other 35mm f/1.4 lenses. Stopping down to f/2 removes nearly 1/2 of the shading and the amount of shading is halved again at f/2.8. About .7 stops of corner shading remains through f/16. Again, these results are normal relative to the other available 35mm f/1.4 lenses. The Sigma 35 f/1.4 is nearly distortion-free and shows slightly less barrel distortion than the other 35mm f/1.4 lenses I've reviewed. And considerably less than the Samyang 35mm f/1.4 Lens. At f/1.4 through f/4, the Sigma 35 f/1.4 shows very little flare even with the sun in the corner of the frame. As the aperture is narrowed to f/5.6, flare becomes apparent and becomes increasingly apparent as the aperture is narrowed through f/16. These results are similar to comparable lenses and do not represent a differentiating factor for most. A fact established earlier in the review is that the Sigma 35 f/1.4 has a 9-blade circular aperture. An example of the 18-pointed stars this lens creates from specular highlights was shown. The 8-bladed Canon EF 35mm f/1.4 L aperture creates 8-pointed stars. Which number of points is better is up to your preference. 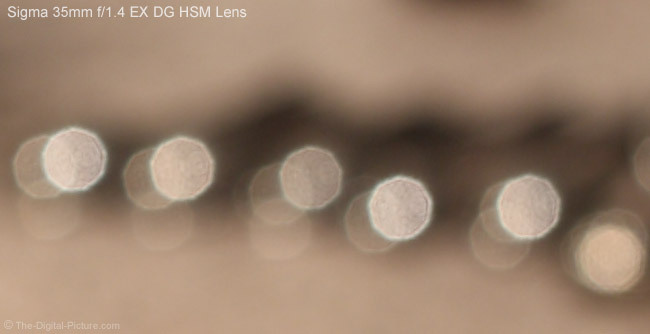 More important to most will be the quality of the out of focus blur created by these lenses. When looking at a busy area of blurred image, these lenses do not perform dramatically different from each other. But differences are very noticeable in specular highlights. 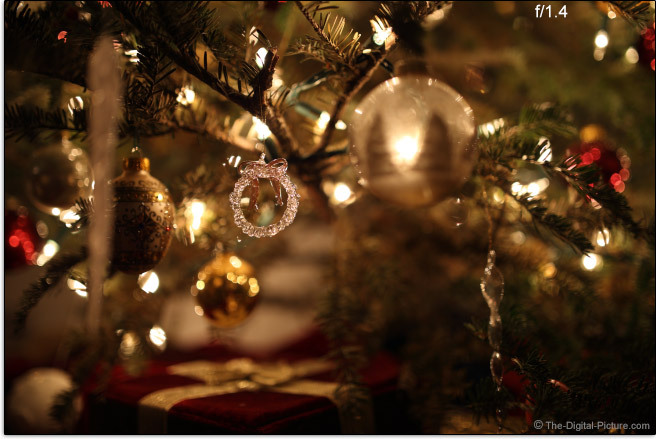 Following is a set of 35mm bokeh (background blur quality) comparisons. I was working on the Canon EF 35mm f/2 IS USM Lens review at the same time as the Sigma 35mm f/1.4 DG HSM Art Lens review, so a pair of Canon 35mm f/2 lenses are included in this comparison. These are 100% crops from identically focused lenses. An f/4 aperture was used for this comparison (wide open apertures usually deliver completely round blurs). To my eyes, the Canon 35mm f/2 IS wins this comparison. It delivers the most-round and most-smooth specular highlight blurs. I'll give the Sigma 35 f/1.4 second place with nearly round and rather-smooth blurs. The Samyang 35mm Lens' pinwheel-like blur designs are my least favorite. The Samyang acts as a slightly longer focal length lens that frames the scene tighter and enlarges the background blur more. That the Samyang's blur is larger does not make it a better lens in this regard. 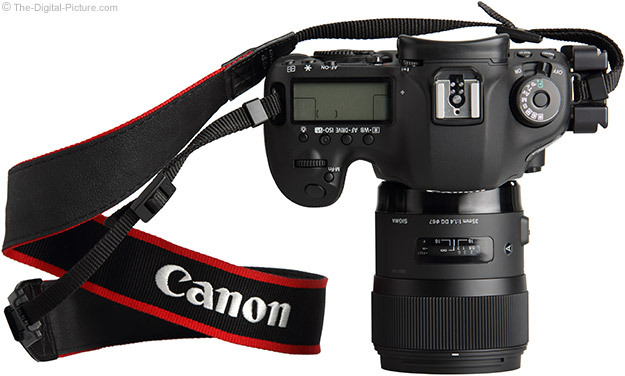 The old Canon L and f/2 non-IS lenses do not have rounded aperture blades. The result is that the specular highlights in stopped down aperture images become octagonal and pentagonal respectively - instead of circles. Octagonal is not too bad, but the L's specular highlight blurs are not as smooth as I would like. I don't like pentagonal at all - unless I'm doing something creatively cutsie - which is very unusual. The above images were identically exposed with exception of the Sigma 35 that needed a 1/3 stop longer exposure to produce a histogram equal to the other lenses in this comparison. The Canon 35 f/2 is about 1/6 stop brighter in comparison, but its exposure was not adjusted in this comparison. The impressiveness of the Sigma 35mm f/1.4 DG HSM Art Lens' image quality becomes most apparent when comparing the results to the other great 35mm lenses. As of review time, I have not used a lens of any focal length (Canon, Nikon, Zeiss, ...) that delivered better/sharper image quality at f/1.4. This comparison of course includes the also-impressive Zeiss 35mm f/1.4 Distagon T* ZE Lens and the Canon EF 35mm f/1.4 L USM Lens. 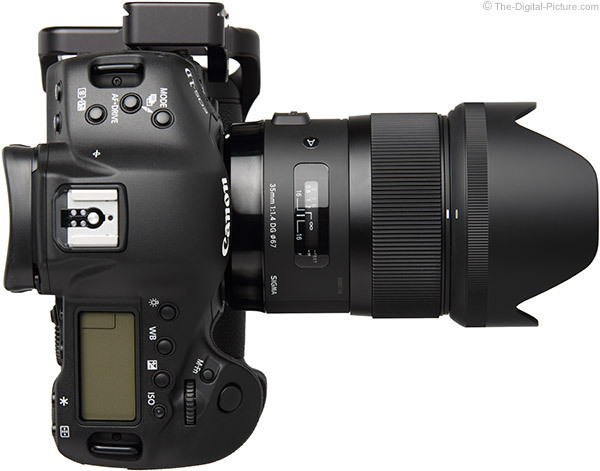 The Sigma's 14 year technology advantage over the Canon is apparent. Update: Several sharper f/1.4 lenses have been introduced since the 35mm f/1.4 Art lens arrived. These lenses include the Zeiss Otus 55mm f/1.4 Lens, the Zeiss Otus 85mm f/1.4 Lens and of special note, the Canon EF 35mm f/1.4L II USM Lens. You are probably buying an ultra-wide aperture lens to use it's ultra-widest aperture setting. But, stop the Canon and Zeiss down to f/2.8 and most of the differences disappear. The Canon and Zeiss are similarly sharp at f/2.8 and both are even modestly sharper than the Sigma in the full frame peripheral area of the image circle (image corners). The Samyang 35mm f/1.4 US UMC Lens also delivers comparable image quality at f/2.8 - and again, sharper corners. The Samyang is a considerably cheaper lens, but minimally lacks an electronic aperture and autofocus (the Zeiss is also MF-only). 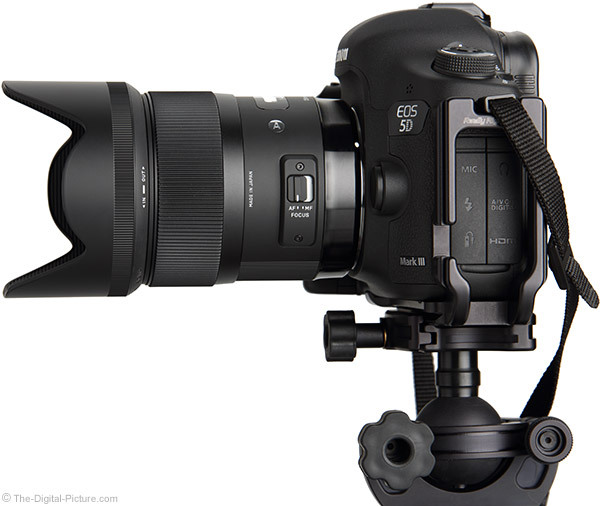 The Sigma 35mm f/1.4 DG HSM Art Lens, like all of Sigma's best lenses, uses HSM (Hyper Sonic Motor) AF. Autofocusing is internal and very quiet, making a light shhhh sound with some clicks being audible to the photographer if shooting in a quiet environment. Autofocusing is quick, though my perception is that the Canon EF 35mm f/1.4 L Lens focuses slightly faster when using both side-by-side. Autofocus accuracy is of course paramount when making use of the great f/1.4 image quality with its shallow DOF. And autofocus accuracy is where I have run into problems with so many non-Canon (or Nikon) lenses in the past, so I was nervous about subjecting such an otherwise stellar lens to the AF testing. The good news is that the Sigma 35mm f/1.4 DG HSM Art Lens performs mostly well in this regard. While it is not perfect and sometimes throws a complete miss, I'm finding the Sigma 35 to perform close to the Canon 35 L in AF accuracy. A somewhat consistent and quite noticeable front focus problem on both of my 5D Mark III bodies required AFMA to correct. You may want to capture multiple images in situations with especially shallow DOF - which will be closer to MFD (Minimum Focus Distance). Note that the focus-and-recompose technique can begin to fail as shallower DOF is achieved. AI Servo performance is decent at f/1.4 and very good with the additional DOF delivered at f/2.8. My keeper rate was reasonable when capturing action with this lens. Subjects in the Sigma 35 frame change size modestly as they go into and out of focus, but the image remains stable during focusing (subject framing changes with focusing on some lower quality lenses). FTM (Full Time Manual) focusing is available and filters do not rotate with focusing. I mentioned the focus calibration problem. 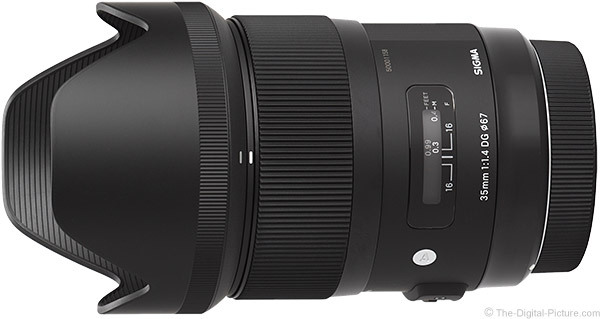 The Sigma 35mm f/1.4 DG HSM Art Lens "... is compatible with the Sigma USB dock and Optimization Pro software to adjust and fine tune focusing parameters." [Sigma USA] Sounds like a great idea to me - one that could prevent MANY repair tickets for Sigma - and save time for the lens owner. 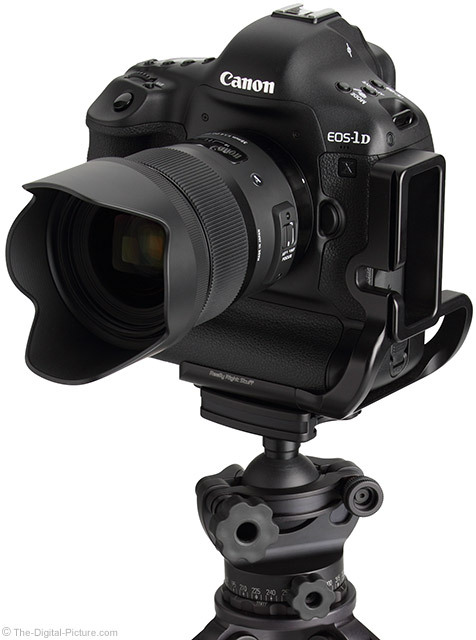 The Sigma USB Dock and software was yet available for purchase at review time, but I expect that the focus calibration problem will be resolvable in the lens with this accessory (shown below). The Sigma 35's nicely-sized focus ring has a nice amount of resistance, but the short 97° of rotation combined with a slight slip-stick characteristic when making very minor adjustments makes critical manual focusing slightly more challenging than it needs to be. Hopefully the slip-sticking goes away after a break-in period. The Sigma 35 f/1.4 is not going to turn any heads for its MFD (Minimum Focusing Distance) spec, but neither will the other 35mm f/1.4 lenses. The following chart lists the 35mm f/1.4 lenses at the top with a selection of other lenses below. Sigma's EX lens line has always featured very good build quality and the changes found in the Sigma 35mm f/1.4 DG HSM Art Lens are positive ones. The look and feel is very high-end - classy and solid with no play and a fixed size (no extending parts). Especially notable is that the finish on this lens and the included hood is far superior to the old Sigma matte finish that was prone to collecting dusty fingerprints - and to peeling. After tearing down a 35mm f/1.4 Art Lens, Roger Cicala's comment was: "I'd characterize the construction of the Sigma as very efficient and carefully laid out" and overall, he was pleased with the internal design. There is plenty of ribbed surface provided for a sure grip. Most-sigificantly ribbed is the focus ring. The deep, sharp, tightly-spaced ribs on the Sigma 35's focus ring remind me of the quality feel of Zeiss lens focus rings - though the Sigma ring is rubber-coated (Zeiss is all metal). That the focus ring ribs seem to hold dust may be a downside to the looks aspect. Additional ribs are provided on half of the lens barrel and on the lens hood (makes removal and installation easier). The rear of the lens hood is rubberized for a sure grip - and a step up in quality feel and appearance. 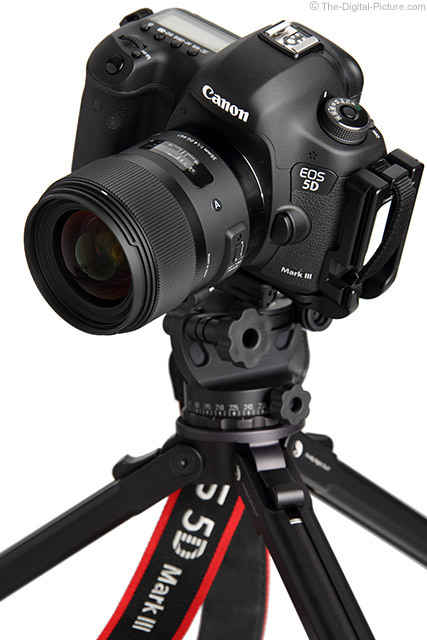 The Sigma 35's single switch, enabling or disabling autofocus, is located within easy reach of the left thumb. A white switch background shows when in AF mode with black showing when in MF mode. The Sigma 35mm f/1.4 DG HSM Art Lens is a mid-sized lens with a solid feel. Lenses with a significant amount of glass in them (typically wide aperture lenses) tend to feel more solid due to their density, but ... this lens feels quite solid in spite of its density. Among other uses, I spent a day carrying this lens around New York City - and found it to be a very nice lens to carry and use even for long periods of time. Here is a size and weight chart comparing first the 35mm f/1.4 lenses followed by an assortment of other lenses. 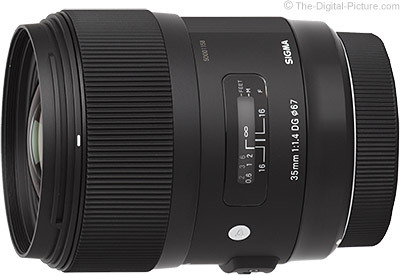 For many more comparisons, review the complete Sigma 35mm f/1.4 DG HSM Art Lens Specifications using the site's Lens Spec tool. Of the 35mm f/1.4 lenses, only the Zeiss is notably different in weight (heavier - you'll understand if you've handled one of these). The canon is slightly lighter, but 3 oz (15g) is not likely to be a differentiator for most people - there are far more important differences to consider. Like price. The price for these 4 lenses, at review time, ranges from $499.00 to $1,843.00 with a sizable step in price between each model. Starting at the top, the Zeiss costs, by a significant amount, the most. The Canon, though costing far less than the Zeiss, still costs considerably more than the Sigma. And, the Samyang costs considerably less than the Sigma, though I think that most people will want to step up to Sigma - minimally for the AF and electronic aperture features. Following are these four lenses side-by-side - oriented from least expensive to most expensive. Note that I used the shallower Sigma rear cap for the Sigma lens image - the lenses are positioned to line up with their mounts. The same lenses are shown below in their fully extended states with their included lens hoods in place. The exposed metal lens mounts showing just above the lens caps in these images tells us that none of these lenses received weather sealing treatment. Notable is that the Sigma 35mm f/1.4 DG HSM Art Lens utilizes the smallest filter size in its class - 67mm. 67mm filters are relatively common and are not the most expensive. 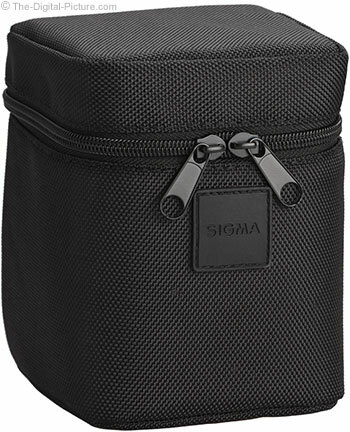 The Sigma 35 ships with a nice zippered, padded nylon case with a belt loop for attachment (this is not a pro photo belt-sized loop). Like all lenses, the Sigma 35 includes front and rear caps with the front being the nice center-and-side-pinch type. The Sigma 35 f/1.4 is available in Canon (reviewed), Nikon, Pentax, Sony/Minolta and Sigma mounts. My standard disclaimer: There are potential issues with third party lenses. Since Sigma reverse engineers (vs. licenses) manufacturer AF routines, there is always the possibility that a DSLR body might not support a (likely older) third party lens. Sometimes a lens can be made compatible by the manufacturer, sometimes not. There is also the risk of a problem that results in the lens and body manufacturers directing blame at each other. I expect that the new Sigma USB dock and Optimization Pro software accessories, with their ability to update lens firmware, are designed to reduce future compatibility risks. The reviewed Sigma 35 f/1.4 was purchased retail online. I think that the Sigma 35mm f/1.4 DG HSM Art Lens is my new favorite Sigma lens. Perhaps the "A" plate on the barrel represents this lens' report card grade average, showing that it has brains to go along with the great looks.